Heading to work? Going on a business trip or on vacation? MiWay’s Route 100 - Airport Express is now operating every 16 minutes, Monday to Friday, along the city’s dedicated bus-only Mississauga Transitway. To celebrate the new Route 100 - Airport Express, which started service on October 29, Mayor Bonnie Crombie and Members of Council were joined by the Honourable Navdeep Bains, Minister of Innovation, Science and Economic Development on behalf of François-Philippe Champagne, Minister of Infrastructure and Communities; Howard Eng, President and Chief Executive Officer (CEO) of the Greater Toronto Airports Authority; Adrian Kupesic, Director, Public and Government Affairs on behalf of Alok Kanti, President and CEO, Bayer Inc; and Tullio Capulli, Vice President, Property Management and Leasing Office & Industrial, Eastern Canada, Morguard Brokerage. Plan your MiWay trip on Route 100 - Airport Express by visiting miway.ca/planatrip or by calling 905-615-INFO (4636) for customized route and schedule information. [L to R]: Councillor Ron Starr, Ward 6; Councillor Dave Cook, Ward 1; David Wojcik, President and Chief Executive Officer, MBOT; Howard Eng, President and Chief Executive Officer, Greater Toronto Airport Authority; Tullio Capulli, Morguard Brokerage; The Honourable Minister Navdeep Bains, Innovation, Science and Economic Development; Mayor Bonnie Crombie; Todd Febbo, Morguard Brokerage; Adrian Kupesic, Bayer Inc.; and Geoff Wright, Commissioner, Transportation & Works. 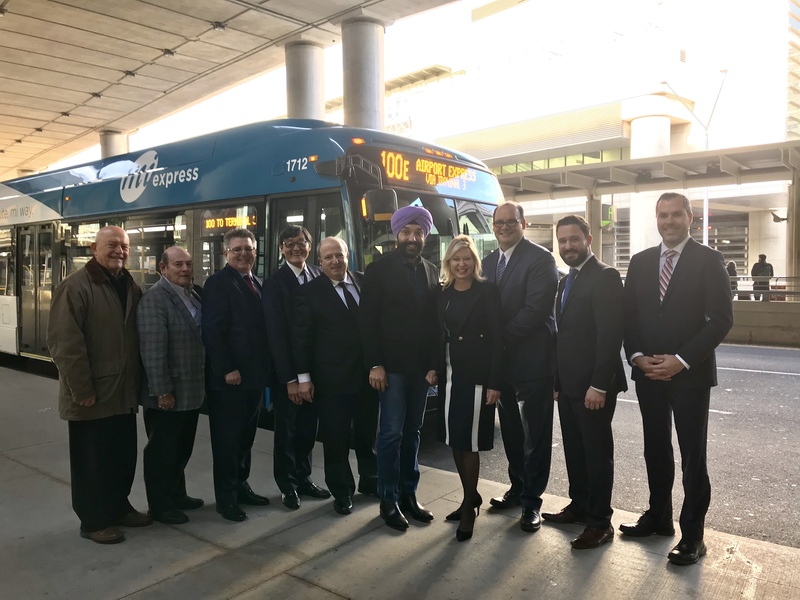 [L to R]: The Honourable Minister Navdeep Bains, Innovation, Science and Economic Development and Mayor Bonnie Crombie arrive at Toronto Pearson International Airport on the new MiWay Route 100 - Airport Express.